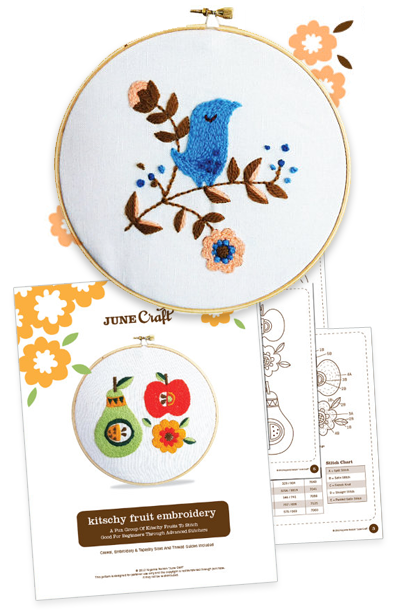 I was just poking around Kayanna Nelson's blog to see what new kitschy cuteness she's concocted lately, and discovered her new crewel embroidery patterns. Retro fun! These two designs are available in her June Craft Etsy shop as PDFs for $6 each. Cute! I used to do a lot of crewel embroidery, remember? I do! And remember the latch hook stuff? I loved those little bundles of yarn. These are so cute, thanks for sharing! I'm new to embroidery and have been looking for inspiration. My goodness these are cute!